These are the children currently living in the home, being schooled by hired teachers in the home (soon to be school building) and being raised by God fearing parents that love each and every one of them. They all have a sponsor that supports them and communicates with them as well. In this home they are cared for very much and have a bright future ahead of them because of the opportunities they now have. You may browse below and read a little about each child and see how special and unique each one really is and even watch a short video clip of each child. Ken’s exact birth date is unknown as well as his location where he came from, but we know he was born sometime in 2004. His mother was still living when he and his older brother Brian were brought into the home. Because Ken’s mother was single and very poor, she decided to bring them to HBC so her boys would have a decent chance of survival. When Ken was brought into the home, he was severely malnourished and didn’t have much hope of survival. Also because of poverty, he only had one set of clothes and he even cried when they tried to put new clothes on him until he understood what having more than one set of clothes was like. Today Ken is doing very well academically and socially. His wants to be an engineer someday and loves to take things apart to see how they work inside. Brian’s exact birth date is unknown as well as his location where he came from, but we know he was born sometime around September 2003. His mother was still living when he and his younger brother Kennedy were brought into the home. 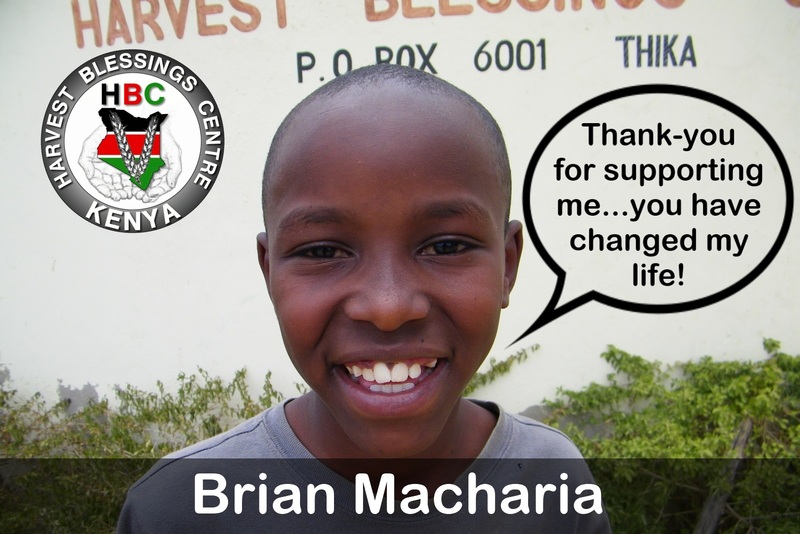 Because Brian’s mother was single and very poor, she decided to bring them to HBC so her boys would have a decent chance of survival. When Brian was brought into the home, he was severely malnourished and didn’t have much hope of survival. Also because of poverty, he only had one set of clothes and he even cried when they tried to put new clothes on him until he understood what having more than one set of clothes was like. Today Brian is a very happy and healthy boy in the home and he is one who loves to work with his hands just as hard as Dad! Mourine’s exact birth date is unknown as well as her location where she came from, but we know she was born sometime around September 2004. Her mother was still living when she was brought into the home along with her sister Purity. Because Mourine’s mother was single and very poor, she decided to bring them to HBC so her girls would have a decent chance of survival. When Mourine first came in the home she was not used to having three meals a day and just getting something to eat was the only thing important to her. Also she received shoes for the first time which she never wore before. Today, she is very healthy and happy, but a little shy and quiet at times. Purity’s exact birth date is unknown as well as her location where she came from, but we know she was born sometime around September 2003. Her mother was still living when she was brought into the home along with her sister Moureen. Because Purity’s mother was single and very poor, she decided to bring them to HBC so her girls would have a decent chance of survival. When Purity first came in the home she was not used to having three meals a day so she would act as though she would not get another meal and eat as much as possible in one sitting until she adjusted. Today she is a very healthy young girl who likes to help Mum with monitoring the other girls and makes a good leader. 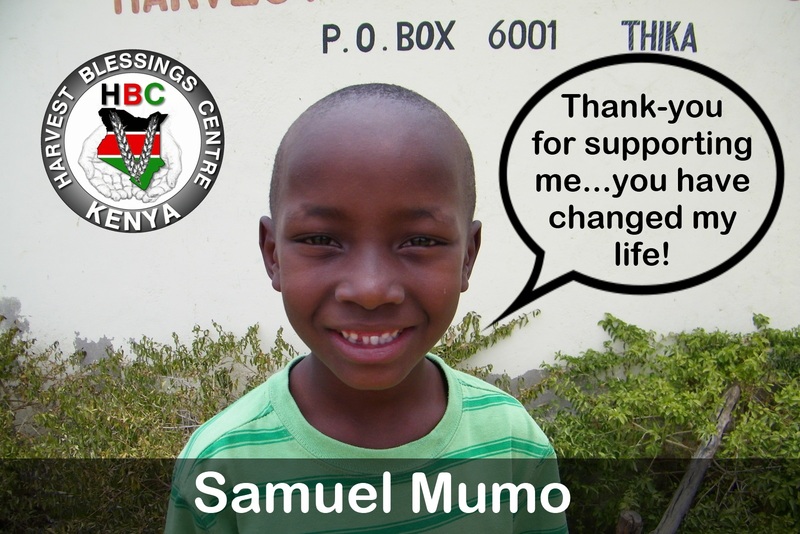 Samuel was born January 19th, 2003 in the Machakos district in the Ndalani village. His mother died while giving birth to his only sister and had to live with his very old grandfather. His sister’s location is unknown and Samuel’s father is undetermined at this time. 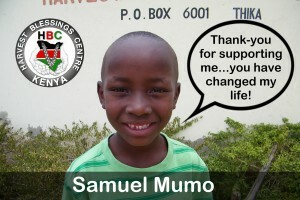 Thankfully in May of 2007 Samuel’s grandfather agreed to allow the boy to grow up in the HBC home because when he arrived because he was very malnourished. Today he is a healthy, vibrant boy who’s ambition is to become Vice President of Kenya and follow in the steps of Kalonzo Musyoka someday. Samuel is also known to have a very good singing voice which he loves to do. Renis was born on November 26th, 2002 in the Machakos district in the Kitanga village. His mother and father both died of HIV AIDS and so he was forced to live with his very elderly Grandmother. Renis was brought into HBC in March of 2007 and he was in fact the first boy there after we opened. His Grandmother has since died (2008) and Renis was able to attend the burial ceremony. Renis is doing very well in school and is a very ambitious little boy. He has stated numerous times that he would like to be the president of Kenya some day. He is very good with mobilizing the other children, leading the group in prayer and also acting as the pastor during their evening devotions. Hannah or sometimes called Ann, was born on August 18th, 2003 in the Nyandarua district in the Matura village. Her mother has died of HIV AIDS and unfortunately Hannah checked on her one night at home and found her dead. She was very traumatized, to the point of constantly checking on her new mother after she was brought into the home in March of 2007. She soon learned that her new mum was not sick like her birth mother and stopped that behavior. She was the very first girl to be brought into HBC and has adjusted very well. Before she was brought in, she was living with her very old Grandfather who was unable to provide the daily necessities for them so he feared for her future. She has a brother, John Richu, who at that time was too young to be accepted in the home but once he was of age, was reunited with his sister there.